G-Mac wrote: Is it appropriate to start a "build Journal", for a TD that is purchased, in order to document changes/modifications or is there a more appropriate location to put that thread? I vote yes. Everyone has something to contribute, regardless of where they are starting from. Sure! We love innovations and modifications! Thanks guys. I'll get one started as soon as I bring it home! You are all encouraged to view my build journal and give me all the thumbs up, +1's, smiley faces and whatever other bandwidth hogging things you wish to post because I need every bit of encouragement I can get!!! Well it's been a few years since I was here last, and while I didn't acknowledge the replies to my previous questions I do appreciate all your answers. 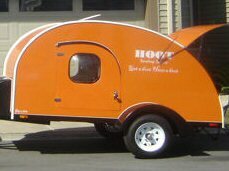 Well it took a little over three years to build my Teardrop but it's finally done. I'm very happy with the design and build. It's a bit larger than most so we can sit inside at the table with plenty of head room, we can play cards/board games, eat etc.. I built everything with the exception of the larger tongue box, and I didn't do the welding. I did however buy the steel and cut all the pieces to be welded. All the bolts are Stainless Steel as are most of the screws, unless they went into aluminum, in which case aluminum screws were used. There were a few brass screws also. All hinges were also Stainless Steel. It's a joy to have, and we took it out last summer several times, one being the Total eclipse - was that AWESOME or what. I compiled many of my pictures and put them in a "slide show" on YouTube. I'm sorry for the messy slides during the build, but I never intended to publish the pictures, otherwise I would have cleaned up the teardrop prior to picture taking. Would love to hear what you all think. Looks like it came out really nice! Good job. Thank you, I am really happy with it. Great job! I'm sure it feels good to be out camping in your creation!